Barolo for under $40? Nebbiolo d’Alba for well under $20? Too good to be true? Giordano Wines is one of Italy’s largest wineries, making wine from most of the regions in the country. All in all they produce over 2,000,000 cases per year. The company is unique in that they have used a direct to consumer model throughout Europe, selling directly to their customers and cutting out the middleman. Giordano is now bringing that model to the U.S., where it is allowed — don’t get me started on the inane shipping laws and ridiculous three-tier system in our country, again cutting out the middleman and selling direct to the consumer which in theory means lower prices for you. This is something we can no doubt support here at The Reverse Wine Snob. Currently Giordano Wines ships to FL, NJ, VA, TX, CA, IL, MN, NV, DC, ID, LA, MO, NE, NH, NV, OR, SC, TN, WI and WY and are actively adding more states. They also have a pretty compellingwine club offer called The Italian Wine Club if you’re lucky enough to be in one of those states: 7 wines for just $39.90 plus shipping (plus an extra $5 off with code WP2014USA5 through 10/31/2014), including a bottle of the excellent Nebbiolo reviewed below (if you choose the all red collection), a free wooden wine box with many accessories and tasting notes and a binder. Of course this all sounds great but in reality it really hinges on the quality of the wine. 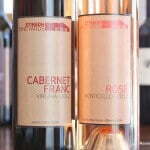 Let’s check out the three wines they sent me (of the 30 or so they offer) and see how they do! First up is the 2012 Giordano Puglia Sangiovese “Apuliae Collection”, a 100% Sangiovese from Apulia, Italy with an SRP of $9.49. Sample submitted for review. The 2012 Giordano Puglia Sangiovese “Apuliae Collection” begins with a nice aroma of red berry fruit and spice. Tasting this medium-bodied, pleasant, straightforward wine reveals simple, rich red berry fruit and soft tannins. It ends dry with the fruit lingering in the mouth for a good time. A nice Sangiovese for the price that would pair well with pasta. It also held up great on day two. Next up is the 2010 Giordano Nebbiolo d’Alba Maestri Italiani, a 100%Nebbiolo from Langhe, Italy with an SRP of $16.99. Sample submitted for review. 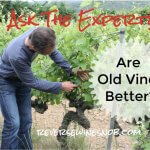 “I carefully followed this wine, from the grapes to the wood ageing and bottling at last. Colour: soft, ruby red. Bouquet: intense and persistent reminding ripe fruit hints and vanilla notes. Taste: clear, well balanced, harmonious, of great character. 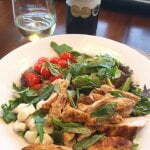 Food matchings: preferably with tasty courses, game, red meat and ripe cheeses. Open 2 hours before drinking and serve at 20C. – Andrea Morra, Enologo. The 2010 Giordano Nebbiolo d’Alba Maestri Italiani opens up into a nicely aromatic nose of black cherry and other ripe, dark fruit, dried herbs and spice with a little time in the glass. The wine tastes very nice, with sweet, concentrated fruit and lots of spice. The flavors include black cherry again, blackberry, cola and a little licorice that comes out on the finish, which also features firm dry tannins and good length. Lastly, we have the wine geeks delight – Barolo. 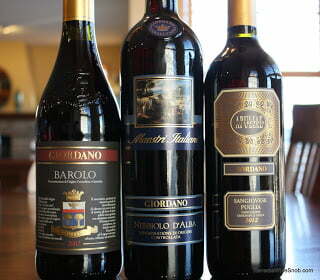 The 2007 Giordano Barolois 100% Nebbiolo from Piedmont, Italy and has an SRP of $38.99. Sample submitted for review. “The Nebbiolo grapes grown on the Piemonte hills, in the Barolo wine district, give this distinctive Docg wine. According to tradition, it ages patiently in oak casks, for at least 36 months. Garnet red, complex, bouquet, medium bodied, elegant tannins, with a long bitter cherry finish. Serve at 18-20C with meat stews, roasted meat, game, matured cheese. The 2007 Giordano Barolo begins with a very nice aroma of dark fruit and spice along with a little vanilla. The wine tastes of rich red and black fruit with loads of spice that lasts all the way to the finish. This is a very drinkable wine, that while perhaps not super complex (for Barolo), is really delicious. It ends with more spice and fruit on the finish that continues for a long time. Not bad for a sub $40 Barolo! I can’t speak for the other 25+ wines they offer, but these three were all quite good! If you’re a fan of Italian wine you’ll probably want to check out their Italian Wine Club offer: 7 wines for just $39.90 plus shipping (plus an extra $5 off with code WP2014USA5 through 10/31/2014), including a bottle of the excellent Nebbiolo reviewed above (if you choose the all red collection), a free wooden wine box with many accessories, tasting notes and a nice binder in which to keep those notes.